According to research carried out by The Gas Safe Register over the last 2 years, illegal gas fitters are putting householders at risk of carbon monoxide poisoning. Gas Safe Register regularly carry out inspections and surveys in an effort to stamp out illegal work and keep the public safe. 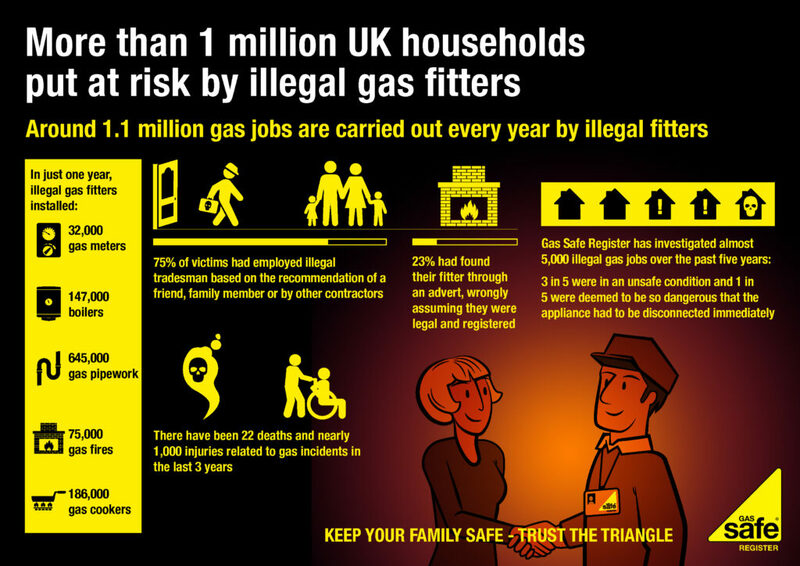 1 million gas jobs are carried out every year by illegal gas fitters who aren’t properly qualified. 1 in 5 gas appliances was deemed so dangerous that it had to be disconnected immediately. 16% of people asked would trust an engineer if they said they were registered, rather than check for an ID card. Some even said they were too embarrassed to ask. 55 prosecution cases obtained by the Health and Safety Executive in 2015 following poor and in some cases deadly gas work. Over 186,000 gas cookers, 147,000 boilers, 75,000 gas fires and 32,000 gas meters were fitted by illegal fitters last year as well as 645,000 instances of illegally fitted gas pipe work. Although Gas Safe Register has a team of employees working hard to search for and stop rogue fitters, they are still slipping through the net. As a result of the worryingly high numbers from the survey, Gas Safe Register have launched the Illegal Engineers Campaign. The campaign aims to highlight the key figures from the research and raise awareness amongst the public. They continue to use the “Trust the triangle” tag line to improve awareness of the Gas Safe brand.